I’m pretty sure we have all had a bad day or several in our lifetime. You know those days where your shoe heel breaks, you’re late for an important meeting, your dog uses your report to chew on…hey it could happen! 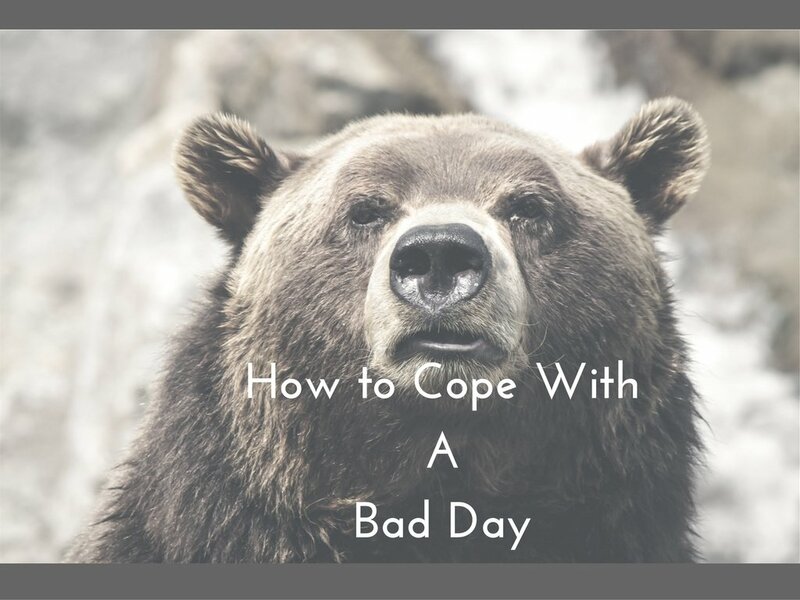 I’m here to share a few tips on how to cope with a bad day. Please remember that a bad daydoes not mean that you’re a failure. Crappy things happen all the time and it’s how we deal with it and ourselves that matters. Feel the anger, frustration, fear or whatever you may be feeling on that day. It’s okay just feel it. Now take a deep breath, exhale slowly and do this as many times as you need. Once you acknowledge what you’re feeling and don’t invalidate them, they tend not to overwhelm you which makes it easier for you to think. You can think a bit clearer now which is great, pat yourself on the back. Now is there something you can do right now in this moment to alleviate the problem(s)? For example if your heel broke and you’re on your way to London Fashion Week to see the Mary Kratrantzou show. Is there a shoe store or shoe repair shop enroute? The dog chewed your copy of an important report, is there a work colleague with a soft copy? The idea is to come up with solutions in the now, to help you do what needs to be done. By this I mean be kind to yourself. There’s a tendency to beat yourself up, with the whole ‘if only’ or ‘shoulda, coulda, woulda’. Take it from me, they don’t help and you end up emotionally spiralling down. So ease up on the self criticism and just accept that things didn’t go the way you wanted. Arguing with reality is pointless, so is beating yourself up. Yes that’s correct, treat yourself. Have you ever treated someone who was having a bad day? Do you notice how it helped them, even if it was a little bit? If no one does it for you, do it yourself. It could be something small like a manicure, or getting nice take out from your favourite restaurant. Heck you can get Deliveroo or UberEats (if you’re in the UK) to do the hard work for you. Life is hard and sometimes we need a treat to help us. We can’t forsee every eventuality or bad day ahead but, we can be prepared and plan ahead. If you think about the last bad days you had, what would have made them go smoother? Could it have been something simple as checking the train times before you left the house? Or the weather forecast, so you don’t get soaked? Little things go a long way and the next time you have a bad day, perhaps something you planned ahead for could help. These are my tips on how to cope with a bad day. Do you have any tips? How did you cope with your last bad day? Share in the comments below. As always thank you for reading and don’t forget to follow to stay in the loop!